Complete the blanks using the correct sequence of pictures of computer accessories. When you talk to your friend using a computer, you need a _________. To listen to what your friend is saying, you need ___________. To see your friend, you need a ____________. For your friend to see you, you need a ___________. Why will the other user need a web cam to see the person?He or she also needs a monitor to see.Not a good question.For your friend to see you, you need a ___________. The type of memory improves processing by acting as a temporary high-speed holding area between the main memory and the CPU. What would be the result of the given steps? Step 1 : Select an Oval tool. Step 2 : Go to drawing area, click and drag the mouse to draw an oval shape. Step 4 : Select any color from the color palette. Step 5 : Go to the oval shape, and right click the mouse. 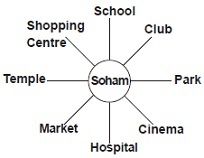 Soham is facing the park. He made a anti-clockwise turn followed by clockwise turn. What is he facing now ? he will face the hospital. sorry not the hospital i thought it it was 1 third turn. School. It is because 3/4 means 3 parts of 4. If he turns anticlockwise 3/4 then he will reach the hospital. After that 1 1/2 turn. If we take it one by one first 1 whole turn will come. He will reach the hospital again. And 1/2 turn means 1 of 2 parts. So he will take a half turn clockwise,(as mentioned in the question) and reach the school. What is the last name of the person who created Twitter? 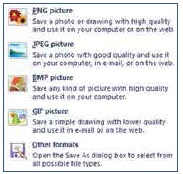 Which of the following options of File tab/Paint button displays the given pop-up menu in MS-Paint? The question is only wrong. analytucal engine is made by ? and which year it made? What is the difference of ram and rom. RAM stores memory temporarily and ROM stores memory permanently. What is the full form of RAM.